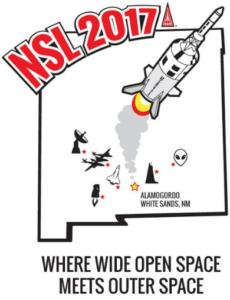 Hosted by FLARE and SMRA, the National Sport Launch will take place in Alamogordo, NM – near the White Sands Missile Range, heart of the American Space program. If you are interested in Science, Space Science, Rocket Science, or Astronomy, you will not want to miss a visit to The Land of Enchantment. This airspace is coordinated with Holloman AFB. We will accommodate HPR Launches up to single N or complex M (maximum of 10,240 N-secs of total impulse for the sum of all installed motors in clusters and stages). We are a bit tired, but we want you to know that we think that you made this a very special National Sport Launch. We thank Jim J. Basler, Jim W. Basler, Denzil Burnam, John DeMar, Lee Dexter, Gloria Kindig, Thomas Kindig, Dave Kovar, Hugh Malcolm, Michael Maurer, Jeff Passner, Joe Pfeiffer, Lee Powell, Richard Rakoff, Vern Richardson, Scott Runyen, an Michelle Zeisset for putting this all together. All of our guests and participants contributed to making this weekend a very safe and enjoyable event for the National Association of Rocketry. Want to taste of what we have to offer? See our NSL 2010 Report. Order your NSL 2017 T-Shirts from Zazzle today. Download our NSL Flyer’s Handbook. When it comes to America’s rocket and space activity, New Mexico might not grab the headlines the way Cape Canaveral and Houston do, but much of the early work and behind-the scenes research that paved the way for America to become a world leader in space happened right here. This continues today. From Robert Goddard near Roswell in the 1930s, through the post-WWII V2 program and continued launch testing at White Sands Missile Range – on to the establishment of Spaceport America today – for eighty years New Mexico has been at the cutting edge, the very frontier, of new developments in space, aerospace, and rocketry. This will continue into the future. It is in this setting that we invite you to come fly with us! This event is sponsored by the Fellowship of Las Cruces Area Rocketry Enthusiasts (FLARE), and the Spaceport Model Rocket Association (SMRA) of Alamogordo, New Mexico. All activities are located in and around Alamogordo, NM. The nearest commercial Airport is ELP in El Paso, Tx., 92 miles to the east. Personal transportation is a must. Bus transport is not available for most of the special activities, or to the launch site. The desert is warming up here in late May, with daytime highs frequently exceeding 90 degrees. You should dress for warm weather, but have jackets or windbreakers on hand just the same. Temperature swings from day to night can be 40 degrees or more, so be prepared for chilly mornings and evenings. We sometimes see cold fronts move through this time of the year and these can bring moderate to high winds. Afternoon thunderstorms and rain are rare at this time but are nevertheless possible. Otherwise, it is sunny, clear, and still – especially in the morning hours. Due to the high altitude and very dry air, this area provides high exposure to UV light, so don’t forget the sunscreen. Please trust us, sandals and flip-flops are not an option in this area. Area sites which will interest you include the New Mexico Museum of Space History, White Sands Missile Range, White Sands National Monument, Sunspot Solar and Apache Point Observatories, Holloman Air Force Base, and the Lincoln National Forest. We have put together some very special events and tours in order to make this a must-go event for the whole family. We would be so pleased if you could join us. The El Paso International Airport (ELP) is an hour and half drive to Alamogordo. You’ll want to take HWY 54 for the most direct route. The Albuquerque International Sunport (ABQ) is an option if you want to see more of the state. It is about a three hour drive. Official hotel is Holiday Inn Express. A special rate of $111/day is available when you call 575-434-9773 for reservations and cite National Association of Rocketry. RV & Camping at the Boot Hill RV Resort. Camping at the site is allowed but utility hookups and water are not available. No reservations needed. FLARE Event director is James Basler. SMRA President Hugh Malcolm is the Range Manager. If you have comments or questions about this site please contact Thomas Kindig. We appreciate the NSL 2017 logo design by Maggie Rodriguez of Web Design Plus.